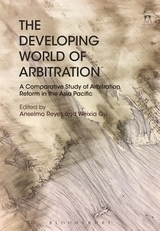 "Conclusion: An Asia Pacific Model of Arbitration Reform"
in Anselmo Reyes and Weixia Gu (eds), The Developing World of Arbitration - A Comparative Study of Arbitration Reform in the Asia Pacific (Hart Publishing, January 2018), pp. 279-300. The Introduction chapter to this book promised three deliverables. The first, a summary of arbitration reform in 12 Asia Pacific states, has been provided in the preceding 12 chapters. The function of this Conclusion is to make good on the remaining two promises.